In a nursing home, an elderly man reads to an elderly woman, telling her a story about young lovers who are separated by the girl’s disapproving parents, then get an unexpected second chance to find happiness. As he reads, the story weaves a spell, taking reader and listener into a romantic realm that transcends time and place. 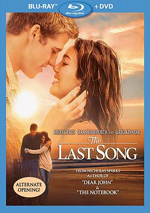 When I reviewed 2010’s The Last Song - a romance based on a novel by Nicholas Sparks – I wondered why I, a 43-year-old straight male, would watch it. But I did, and I thought it was pretty weak. When I reviewed 2012’s The Lucky One - a romance based on a novel by Nicholas Sparks – I wondered why I, a 45-year-old straight male, would watch it. But I did, and I thought it was pretty weak. So why am I, a 46-year-old straight male, reviewing 2004’s The Notebook, a romance based on a novel by Nicholas Sparks? Excellent question, and one I don’t know if I can answer other than via a sense of perverse curiosity. Of all the films based on Sparks’ books, Notebook seems to be the most popular and best-regarded, so I figured if ever I had a shot at enjoying one of these flicks, this was the one. Notebook opens at a nursing home, where we meet elderly but spry Duke (James Garner) and fellow resident Allie Calhoun (Gena Rowlands), a woman who suffers from Alzheimer’s. Duke regularly visits Allie and reads to her from his journal. This takes us into flashback mode as we go back to 1940 and encounter handsome but poor Noah Calhoun (Ryan Gosling). One night at the carnival, he spies lovely teen Allie Hamilton (Rachel McAdams), part of a wealthy family. Noah immediately takes to Allie and attempts to woo her. Initially she resists his charms, but his persistence wins her over and gets him a date. From there an improbable romance begins. Noah and Allie become inseparable and must confront a number of challenges, most significantly the opposition Allie encounters from her stuffy parents (David Thornton and Joan Allen). We follow the Noah/Allie relationship with all its twists and turns. At the start of this review, I noted my not-especially-enjoyable prior experiences with films based on the works of Nicholas Sparks. Would the third time be the charm? Nope – not at all. Due to its cast, The Notebook might provide a marginally better film than Last Song or Lucky One; leads Gosling and McAdams pretty easily trump Miley Cyrus/Liam Hemsworth or Zac Efron/Taylor Schilling. With other talents like Garner, Rowlands, Allen, and Sam Shepard, we find a good roster of performers on display here, and they do their damnedest to elevate the material. Alas, there’s no way they can fix what ails the relentlessly stale and trite Notebook. How many times have we seen movies similar to this? Noah comes out as a non-existent dream guy: he’s a man of the land, with good, basic morals who also reads poetry and just happens to be a super-hunk. He’s a fantasy, pure and simple, and the movie does nothing to expand the role beyond those basics. Honestly, much of Notebook plays like a land-locked Titanic, with Noah as Jack and Allie as Rose. Granted, it covers a much wider variety of relationships, circumstances and eras than Titanic - which takes place over a few days, not many years – but it’s not hard to view the two films as siblings. Unfortunately, Notebook lacks the passion and drama of Titanic and plays like Paint By Numbers romantic drama. At no point in the movie do we question what’ll happen along the way, as the entire slow, plodding story just leads us toward the inevitable. Obviously some invest in this predictable outcome, but I don’t; at no point do the characters provide any reason for me to care about or buy into them, as they’re just cardboard romantic fodder. Even the movie’s “big reveal” about Duke and elderly Allie should come out of nowhere to no one; maybe the filmmakers don’t intend this to be a surprise, but I get the feeling we’re supposed to go “wow!” when we figure out their connection. We don’t, and not a single other “wow!” moment ever emerges from this cliché, turgid film. I’m not entirely immune to the charms of romantic chick flicks – heck, I still get a kick out of Pretty Woman - but beyond a strong cast, The Notebook lacks redeeming qualities. The Notebook appears in an aspect ratio of approximately 2.40:1 on this Blu-ray Disc. Much of the image looked great, but one notable flaw marred the presentation. And what was that problem? Edge enhancement, as a lot of shots suffered from prominent haloes. These weren’t completely pervasive, but they popped up much more often – and to a much more obvious degree – than I’d expect. Otherwise, the image was aces. Even with the haloes, the movie showed strong definition. A little softness could appear in some wide shots – usually abetted by the edge enhancement – but usually the film displayed solid delineation. No issues with shimmering or jaggies occurred, and the movie lacked source flaws or obvious signs of digital noise reduction. Colors looked lovely. The movie went with a warm, rich palette that came across well here; in particular, reds appeared sumptuous. Blacks were dark and dense, while shadows offered nice clarity and smoothness. Without the edge enhancement, this would’ve been an “A” image, but as it stood, I couldn’t rate it above a “B-“. As for the film’s Dolby TrueHD 5.1 soundtrack, it provided typical “romantic drama” fare. The soundfield didn’t have a lot to do; it concentrated on good stereo music and general ambience. Scenes at the ocean or during the carnival opened up matters a bit – and a short World War II battle scene added punch - but the track usually remained restrained. Audio quality was positive. Speech seemed natural and concise, without edginess or other concerns. Music appeared fairly full; the score could’ve been a bit more vibrant, but it came across with reasonable definition. Effects didn’t impress but they weren’t supposed to do so; they remained clear and accurate, though. Nothing here impressed, but it worked fine for the story. This 2013 “Ultimate Collector’s Edition” appears to provide the same Blu-ray previously released along with some non-disc-based materials. In terms of extras, we open with two separate audio commentaries. The first comes from director Nick Cassavetes, as he delivers a running, screen-specific look at how he came onto the project, cast and performances, story/character areas, sets and locations, music, editing, issues with the MPAA, cinematography, some period elements, and a few other topics. If Cassavetes made movies half as bright and funny as this commentary, he'd win Oscars. From start to finish, the director delivers a delightful take on this film, as he covers a wide range of subjects and does so in an honest, upfront manner. In particular, I like his discussion about working with his mother, Gena Rowlands, but pretty much everything here works - it's a great chat. For the second commentary, we hear from novelist Nicholas Sparks. He gives us his own running, screen-specific discussion of aspects of his writing career, the origins of and influences on his novel, comparisons between the book and the movie, thoughts about the flick's creation/shoot, and connected subjects. Sparks follows Cassavetes' track with an equally good commentary. He's more reserved than the director, but he digs into the topics in a thorough manner that sheds a lot of light on his creative processes and story/character areas. Sparks keeps going at a nice pace and turns this into a strong track. Four featurettes follow. All in the Family: Nick Cassavetes goes for 11 minutes, 39 seconds and offers notes from Cassavetes and actors Sam Shepard, Ryan Gosling, Rachel McAdams, James Garner, James Marsden, Joan Allen and Gena Rowlands. “Family” looks at what Cassavetes brought to the project as well as aspects of the shoot. A few decent moments appear here but the piece feels rather fluffy and insubstantial. During the six-minute, 36-second Nicholas Sparks: A Simple Story, Well Told, we find notes from Sparks, Time Warner Book Group CEO Laurence Kirschbaum and Time Warner Book Group publisher Jamie Raab. “Told” tells us how Sparks sold Notebook and its success. This becomes a love letter to Sparks and his book. Southern Exposure: Locating The Notebook lasts 11 minutes, 33 seconds and offers info from Marsden, Shepard, screenwriter Jeremy Leven, location manager Steve Rhea, producer Mark Johnson, preservationist Randall Goldman, Boone Hall Plantation office manager Julie Rowe, production designer Sarah Knowles, and Black River Plantation owner Robert DeLapp. As implied by the title, “Exposure” goes into sets and locations. It becomes a reasonable overview of the movie’s locales. Finally, Casting Ryan and Rachel runs four minutes, six seconds and features Johnson, Gosling, Shepard, Cassavetes, and McAdams. As expected, the featurette tells us how Gosling and McAdams wound up on the film. It’s short but acceptable despite a lot of praise for the actors. 12 Deleted Scenes occupy a total of 28 minutes, 33 seconds. These tend to either add to existing sequences or just expand already established character/story concepts. One makes Allie’s mother more of an active liar, and another casts doubt about Duke’s real identity. Fans will enjoy the material – especially the extended love scenes – but I don’t think there’s anything particularly useful here. Indeed, some of the footage spells out concepts way too clearly and would’ve made the movie drag more than it already does. We can view the scenes with or without commentary from editor Alan Heim. He tells us about his career and how he works as well as aspects of the various scenes and why they got cut. Heim makes this a much broader, deeper deleted scenes commentary than most; it’s a terrific discussion. In addition to the film’s trailer, we get a Rachel McAdams Screen Test. It fills three minutes, 37 seconds and shows one scene between McAdams and Gosling. We see a little of this in the “Casting” featurette, but it’s cool to watch the whole thing here. A second disc provides a DVD Copy of The Notebook. This appears to replicate the original 2005 release, so it includes the same extras found on the Blu-ray. A number of physical materials come as part of this Ultimate Collector’s Edition. An envelope holds six movie-related postcards, and a small locket comes in the box. Finally, we get a journal that includes a few movie quotes but mostly remains open for the owner to use. Slow, predictable and trite, The Notebook gives us lowest common denominator romantic drama. It comes with a talented cast but lacks any real emotion, creativity or drive. The Blu-ray delivers picture quality that would excel without copious edge haloes; audio is fine for the genre, and the set includes a solid selection of supplements. I feel pleased mostly with this release, but I take no pleasure from the movie itself. In terms of purse strings, I suspect most will want to pursue the standard Blu-ray release – with its $15 MSRP - and leave this expensive Ultimate Collector’s Edition to the film’s most devoted fans, as its additions don’t seem to be worth the substantial extra cost.